An aftermarket Engine Management System is a very powerful tool, but not long ago it was a unit that was reserved for race teams and players with big budgets. AEM set out to change that by making an affordable, easy to use, plug and play EMS for the masses. 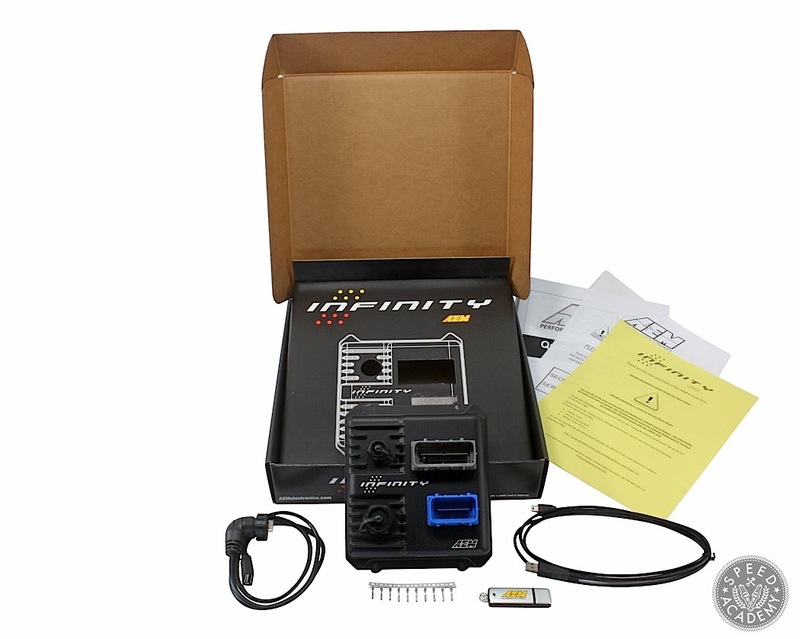 The AEM EMS Series 1 was born over 10 years ago and was an instant hit with tuners and race teams alike. 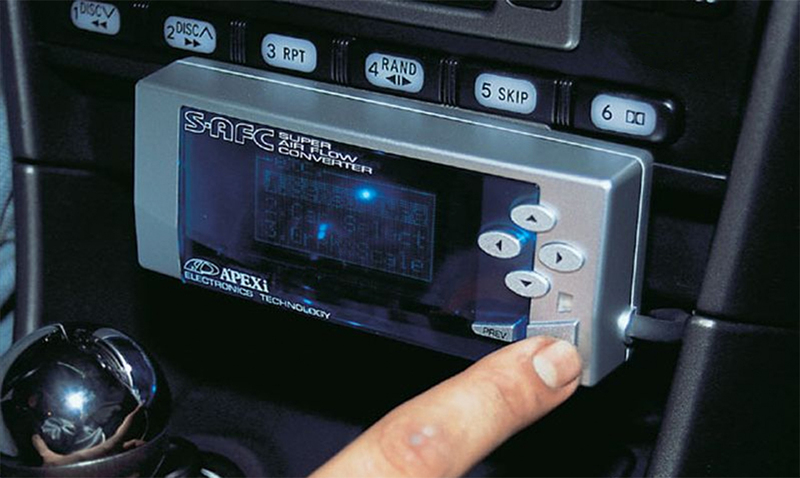 If you’re old enough to remember this unit then you know the S-AFC was a very popular tuning tool in its day. I can attest to the groundbreaking nature of AEM’s Series 1 EMS because I tested several of them on various cars. Back in ‘04 I saw firsthand the real potential of a standalone EMS on a turbocharged Eagle Talon TSi. The car was running a stock computer with an APEXi AFC, a fairly primitive piggyback system that would intercept and alter the airflow signal to the factory ECU in order to richen or lean out the air/fuel mixture. This setup worked pretty well in its day, but it certainly had its limitations since there was no timing or ignition control. To go from such a basic piggyback setup to an AEM Series 1 EMS was, to put it mildly, a complete game-changer. All of a sudden I had control over every running function of the engine, and after just one dyno tuning session the Talon’s drivability improved dramatically, plus it made more power to boot! I knew then and there the AEM EMS was going to mark the beginning of a new era for enthusiasts who were serious about making horsepower the right way. Fast forward a few years and the Series 2 EMS entered the market with enhanced and improved tuning possibilities, further improving on and already solid architecture. But electronics moves at a rapid pace, so to stay on the leading edge AEM Electronics has just released a completely new and incredibly powerful EMS called the Infinity, a unit that offers the kind of tuning power and flexibility we’ve only ever seen in extremely high-end (and thus extremely expensive) systems. Considerably smaller than the Series 2, the Infinity is more than 3 times faster than its predecessor thanks to its 200MHz, 32-bit processor that can process 400 million (that’s eight zeros!) instructions per second. Add an incredible resolution to the mix, like 0.0000001 of a second (that’s 1/10th of a microsecond) and you have fuel control with almost infinite adjustability for things like injector pulse width and driver control. The result is a much smoother and more optimal performing engine. There are so many other features that I could list off here but you can go read those on AEM’s website. Instead, lets look at some actual data of how the system works in real life. David Choi is the owner of this 2004 Infinity G35, which has all the common bolt-ons plus a Vortech supercharger. 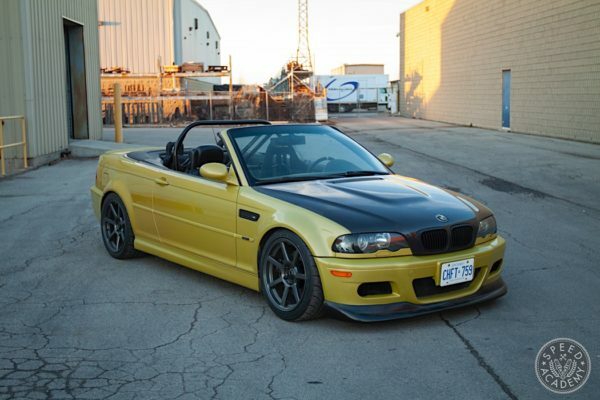 The car was tuned on the stock ECU using a reflash and made 466whp and 380ft-lbs of torque on Church Tuning’s Dynapack dyno. Shortly after dynoing it on the stock ECU, we swapped it out for the Infinity EMS, which was a simple plug and play affair thanks to the adapter harness. AEM is constantly working on offering more and more plug and play applications so check their site often if your car isn’t listed. Or you can always have a custom harness built. Admittedly, the preliminary EMS setup took a little longer than I expected but the new Infinity Tuner software is very intuitive and requires a good amount of initial data about the engine to ensure tuning is accurate and precise. 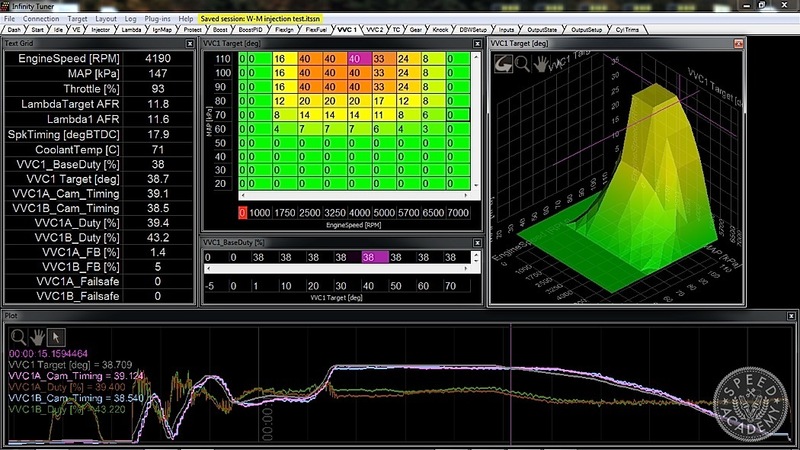 The extra time spent setting up the software is made back during dyno tuning as the system features an auto-learning mode that if setup properly will reduce time spent on the rollers. 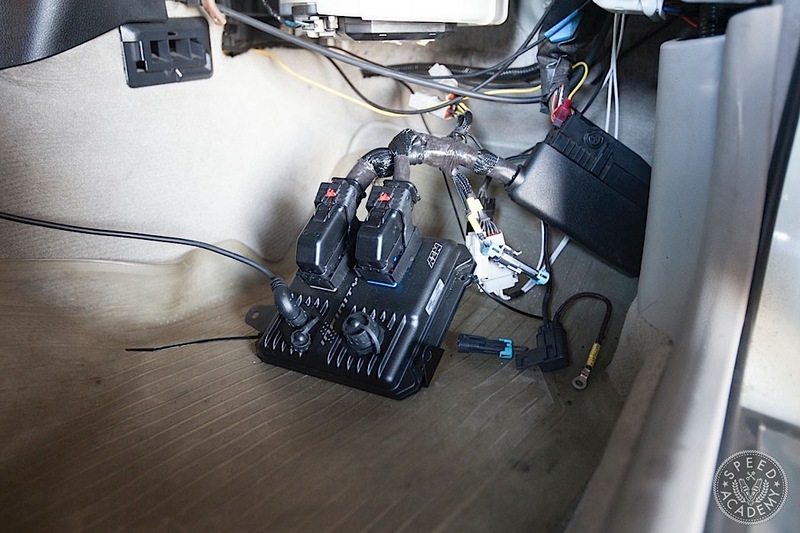 As for features there are so many to name; advanced knock control, dual lambda/wideband 02 sensor control, flex fuel that adjusts for ethanol content, boost by gear/target, drive-by-wire control, failsafe warnings, and much, much more. The Infinity allows full control over Nissan’s CVTCS (Continuously Variable Valve Timing Control System), or VVC (Variable Valve Control) on the VQ35DE-RU engine for both intake cam advance and exhaust cam retard. 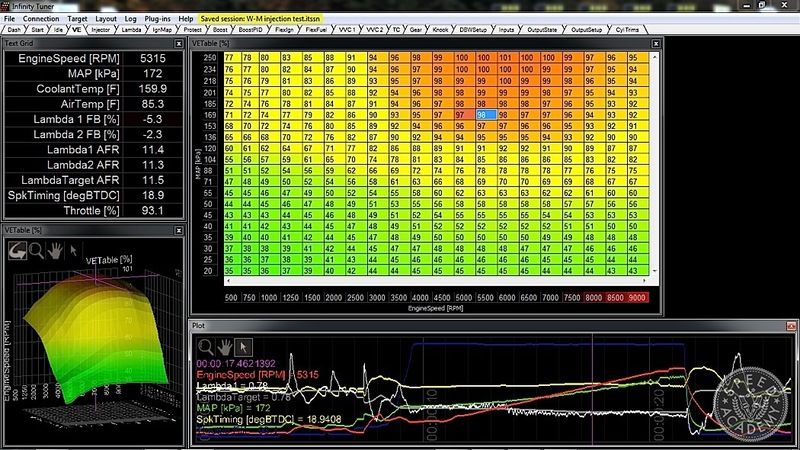 The tuner is able to command a cam angle based on RPM and load (in this case manifold pressure) and the Infinity’s closed-loop PID feedback system keeps the cam angle on target. AEM has also drastically improved the layouts on the InfinityTuner making it much easier to use for both novices and expert tuners. Users are now presented with minimal amounts of tables to tune the engine making it much simpler and less daunting than previous software versions. The thing that impressed me the most was the actual speed of the system. Just the way it responds to the feedback of the sensors and is able to make changes. This car has dual widebands for each bank, and watching the two sensors feedback in real time, it’s amazingly fast…and we’re not even running it as fast as we could to avoid oscillations. That is pretty unprecedented from my experience working with standalone ECUs and we’ve worked with most of them out there. 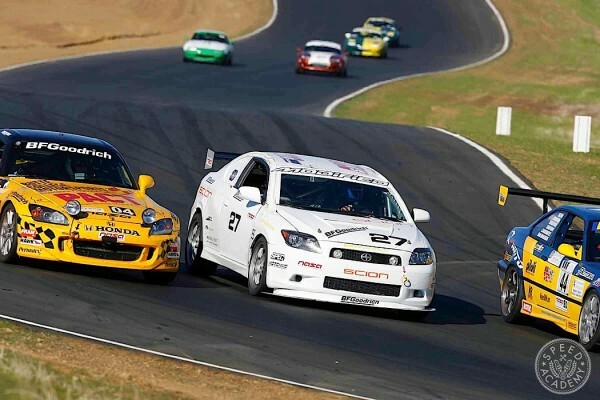 On a racecar that is running at the upper limits, that’s critical. So, if you have something that responds very quickly—even if something changes at the track—you know you are covered. Along those same lines, the knock sensor was very critical for us here. 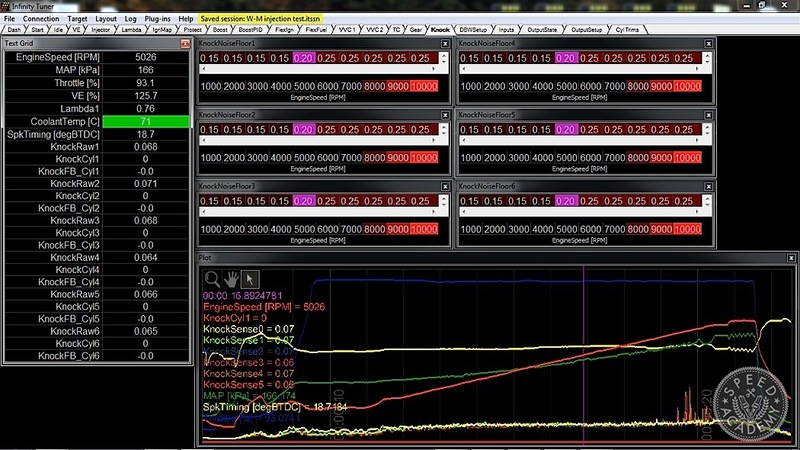 With the VQ35s and the factory ECUs, the knock sensor doesn’t get used above 5500 RPM. The ECU will simply average out what it sees from the knock sensor below 5500 RPM and apply it above that point. We see that with a lot of factory ECUs. I guess there’s just too much noise for them to filter it out effectively and they want to make the power so they just turn it off. Using the Infinity I was able to see definitive knock noise, and see it in specific cylinders. Even compared to the older systems the Infinity is better because now I can watch this real-time logging on my laptop instead of having to download the logs and look at them afterward. We get instant feedback and I can even shut it down if I am not happy with something that I see on the knock curve. Being able to log individual cylinders like that instantaneously is really critical. Typically on the VQ35s we see that cylinders 5 and 6 are the ones that are most susceptible to damage. Whether that’s an airflow distribution issue or temperature or whatever the case is, they are the ones that fail first. And in fact when we began to add timing to see where the engine is going to reach its limits, we saw some knock noise beginning on cylinder 6 first, and then cylinder 5. That fits exactly what we know with failure analysis of the motors and it tells me that it’s not just noise we should be ignoring, but it’s noise that actually means something to us in the knock sensor. So that’s real critical, and in fact it made extracting the same power as the stock ECU with the Infinity more difficult because we have much better data and are protecting the motor. 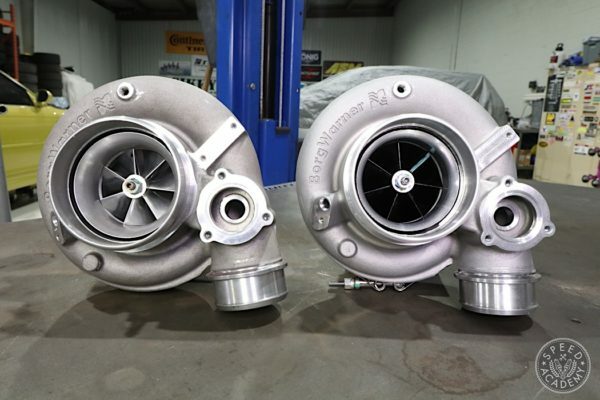 While an extra 10 or 20 horsepower may look good on a dyno sheet, you aren’t going to notice it as much as you notice a bad cylinder or a blown motor. The VE table for the Infinity uses a 20×20 layout and you can see the datalogging box below the table along with a 3D map of the VE table lower left, with a text grid for monitored functions next to the table. In this log you can note how the tracer in the datalog (pink line) also highlights the current cell being used in the VE map. This helps speed up the tuning process by isolating the cells in the VE table that you are looking at to make quicker adjustments. Also, note that the dual internally-controlled Lambda sensors are automatically adjusting fueling independently per bank to keep the AFR on target (Lambda 1 FB % and Lambda 2 FB %). As for the software, AEM made a big jump when they went from the AEMPro to the AEMTuner software, and this is just another evolution beyond that. The usability is all in how quickly it responds. That’s another thing, making big block global changes even with the AEMTuner software would sometimes take time to process to the ECU, but with the Infinity it’s instantaneous. You don’t have to wait and you can make changes very quickly. 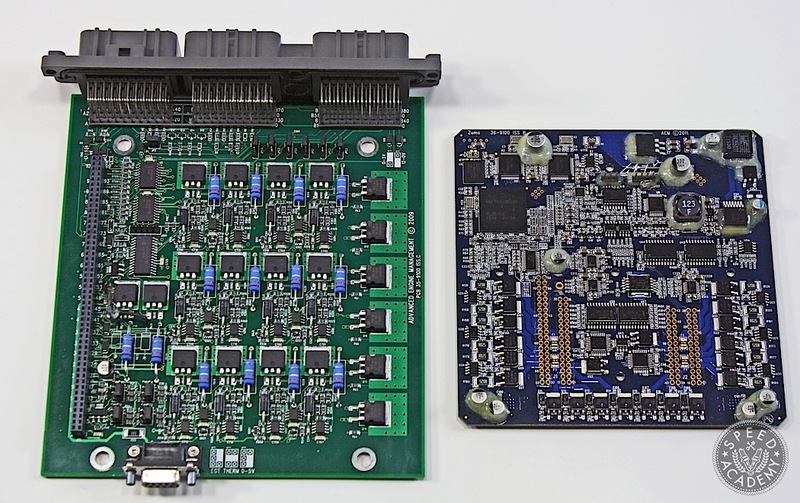 We can take all that adaptability that’s built into it and customize the ECU for how we want it to respond to various conditions. We have our knock, our rev limiters and boost cuts, we have our O2 sensor feedback…we have so much control and are able to define so many different things now in the tables which is nice. Being able to go this deep with custom mapping really takes it to another level for us. When you start getting into high dollar race stuff being able to custom define inputs and outputs on tables is really nice. To be able to say ‘I need this input to affect this output this way’ and have the functionality there is critical. In a lot of ways the Infinity is an evolution, but I think the speed is a quantum leap. The functionality is there in every way and better than the older stuff but the speed is the first thing I noticed. Obviously that makes my life as a tuner easier but it also means the engine is going to run that much better and that it is going to be that much more adaptable to changing conditions, which is really what you want. You can tune a car to run perfectly on the dyno but the track is always going to be a little different. 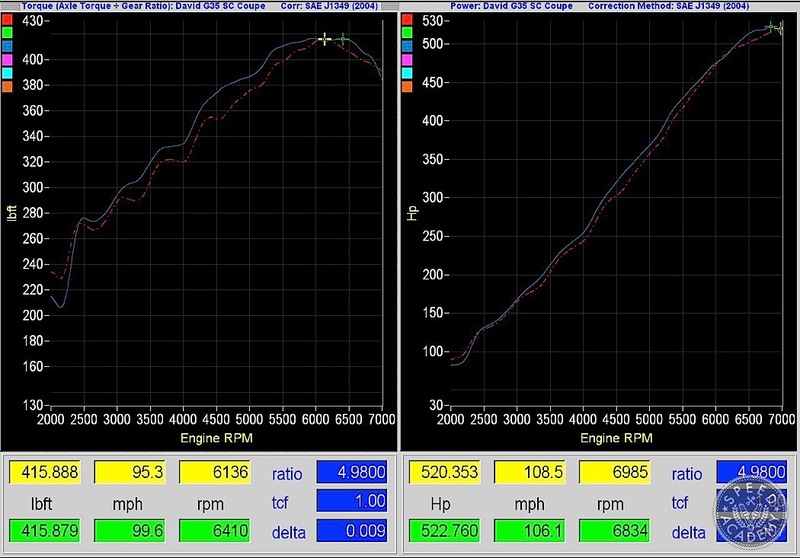 We are always out there doing testing and data logging , but if you have an ECU that you can count on to hit the targets that you want and it has a range of adaptability that means it can handle some variances that occur like temperatures variances, fuel variances, atmospheric pressure variances, whatever it is, it makes me feel better as a tuner because I know I can push the envelope a little more knowing that if something happens at the track a motor isn’t going to come back to me grenaded because we were running too close to the edge. That means more power and more safety if you are doing it right, and this ECU really makes it easy to do that. If that doesn’t convince you of the Infinity’s capability and effectiveness then I’m going to have to quit doing this. Oh and if you haven’t heard of this Sean Church character and his business Church Automotive Tuning, he is one of the premier, go-to southern California tuners. 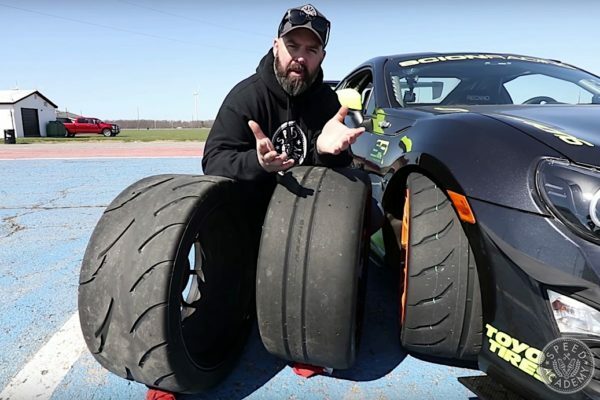 The man has tuned pretty much every type of engine out there and what really makes him a standout to me is he tunes a car to your needs and communicates what he is doing/has done to the tune so you too can understand what’s going on inside your engine. And how about the dyno numbers? 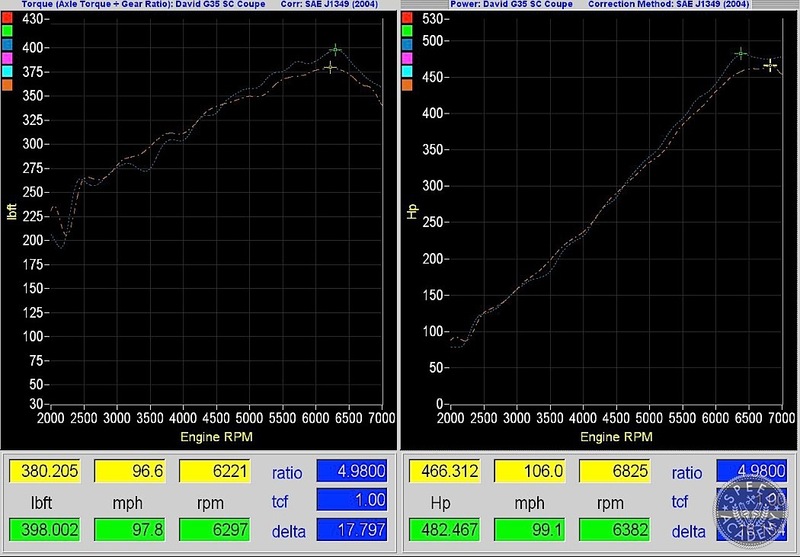 Well, you’ll notice that the Infinity tune didn’t make as much peak power as the stock reflash (482whp vs 466whp). I can already sense the keyboard racers frothing at the mouth. Relax… take a deep breathe. There’s very good reasoning for it. Due to the Infinity’s advanced knock filtering capability, excess knock “noise” is greatly reduced, making it much easier to detect when actual knock is present. The Infinity also lets the tuner define a unique noise threshold, or “floor”, for each cylinder. This is useful when some cylinders appear louder or quieter to the knock sensor than others; with per-cylinder thresholds tuned properly, knock can be accurately detected on each cylinder. As Sean mentioned, the stock ECU doesn’t read knock above 5,000 RPM. Rather, it uses data up to that point and interpolates knock from 5k to redline. Therefore, the ECU tune makes more power above that marker but it’s very likely that the engine was picking up knock meaning it’s running on the ragged edge. For some quick wide-open throttle pulls on the street there’s nothing to worry about. However, for the racetrack or drag racing, you’re playing with fire . All it takes is a bad tank of gas or a sudden lean condition and game over. With the Infinity tune, it always within a safe margin, meaning you’ve got a reliable tune that will perform consistently lap after lap. I don’t know about you, but for me that’s more important than 15 peak whp. I like to keep my motors intact for as long as possible. Bent rods or melted pistons do make for great paperweights or war stories, but they come at a heavy cost. And that’s what makes a standalone engine management system like the AEM Infinity such a worthwhile investment. Not only does it allow you to tune for maximum efficiency but (with the right tuner) it’s done in a manner that ensures your engine is going to be reliable and dependable, something that should always be a priority over peak horsepower and torque. It should be mentioned that this G35 was on California 91 pump gas which is arguably the worst gas in the country to tune on. With some water/methanol added into the equation, the Infinity EMS tune picked up some strong torque gains across practically the entire RPM range (+13wtq@4500rpm) and even beat out the stock ECU tune in the WHP department. Not by much but remember that the VQ is now running a much safer tune so it’s essentially got the same horsepower as the reflash with meth but achieves it in a much more reliable and safe manner. 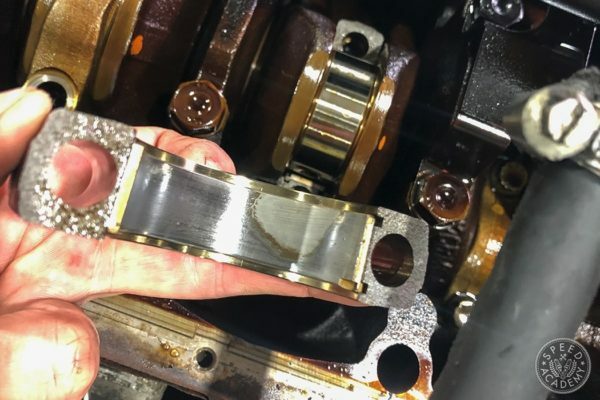 It goes without saying that with high-octane pump gas, or in this case a healthy injection of water/meth, a more aggressive approach to tuning can taken without compromising the engine’s safety margins.